On Second Scoop: Ice Cream Reviews: NEW!! Edy's Slow Churned Shakes and Smoothies! Vanilla is up first! NEW!! 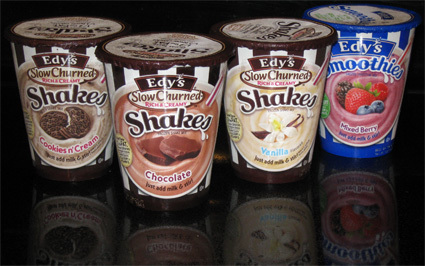 Edy's Slow Churned Shakes and Smoothies! Hey everybody, can I vent for a second? I'm feeling kinda cranky, but I really, really want to complain about how easy it is to buy the opinion of a blogger. Hey, I claim no immunity here. If someone sends me something free, I'm going to go the extra distance to try and at least find some redeeming quality about what I've been given. No, I don't have to love it, but if a company takes the time to send something over, I will try to at least be positive about something. Now, that being said, go ahead and try to look up these new shakes on the internet. You're going to stumble across several sites talking about how hard and complicated it is to make a milkshake? really? It's milk and ice cream. I mean, come on, you don't even need a blender. 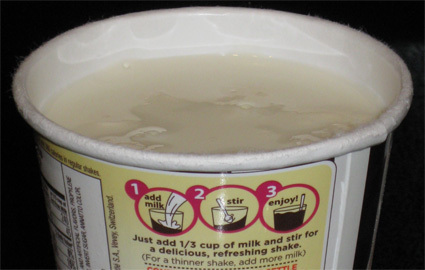 You get a big plastic cup or container, fill it with some ice cream, pour in the milk, and let it sit for 7-10 minutes (higher fat content will melt slower). Now stir it up and away you go! Sure you have to wait a little, but that just makes it taste all the better, and you are even saving the planet by not wasting electricity... Ok, now you just think I'm being crazy, or just a jerk, but at the very least, can we all agree that flavor should be the selling point here, not the overall ease of the product? It's not that easy isn't a selling point, but at a $1.50, this thing better be extremely good since I could feed an entire family milkshakes with a $3 half gallon of ice cream. Ok, let's go back to the beginning. I'm at Walmart and about to leave when I see something brandy new! Not just that, but it's a complete assortment of 3 shakes and 3 smoothies! Oh I'm excited! I love new products and more importantly I love milkshakes. I'm trying not to get my hopes too high, but I have to bring home more than one. I picked up my first container and the first thing I noticed is that this doesn't feel (or sound) like those ice cream ball milkshakes. Hmmm, I wonder what's inside? Let's grab a chocolate, a vanilla, a cookies & cream, and for good measure, a mixed berry smoothie. The smoothies I skipped were strawberry banana and tropical, and no, I didn't try one on the way home, but don't think I wasn't tempted. Wow, I wasn't expecting that! 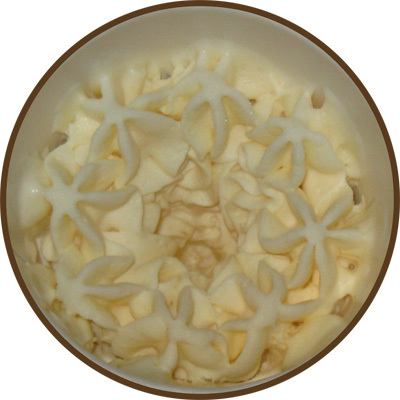 This funky star shape must allow the milk to flow freely, though there is this weird tunnel/hole in the center that's probably hard for you to see. To be honest, I know there is a good Boba Fett joke here, I just can't think of it. The instructions say to add a 1/3 of a cup of skim milk. I'm out of 2%, and I despise skim, so we're going with some 1%. 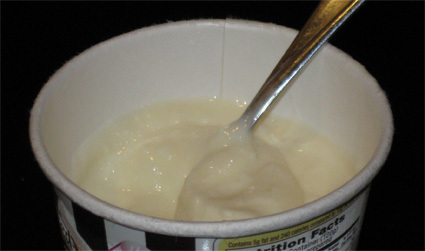 A third of a cup brings the milk to just over the top of the ice cream. The good news is the star design really does work and I can instantly go to work on smushing up my shake. It's easy work and takes little time sinceI'm getting very little resistance from the slow churned ice cream. I have a couple of spoonfuls and it's ok, but you have to use a straw to truly test a shake. Hmmm, It's ok, but a little thick, so I add a little bit more milk. Ok, it's going down (well up) a bit easier, but little tiny ice chunks keep getting stuck in my straw, and even when they don't get stuck, I'm still chewing on them, and that is not my idea of a good shake. Maybe there were ice crystals buried in my container, probably in all those star shaped air gaps, or it's just the nature of the ice cream, I don't really know. Even if I ignore the ice chunks (which aren't awful mind you, just annoying), the big problem here is taste. It's got that fake vanilla taste, kind of like a cheap vanillin pudding. I finished the shake off, but I have no desire to pick up another vanilla one. I'm hoping cookies & cream is better! The deed is done, but am I full? Well, at first I didn't think so, but after about 15 minutes I felt really full (which was inconvenient considering I had just finished making dinner). I can freely admit that I was tempted to have a second one around 8 o'clock but I decided to have some no-fat Italian Ice instead (I try hard not to have ice cream twice in one day). I'll try to have another flavor tomorrow! Let's hope for the best! listen, jerk, my blender is solar powered, so i wouldn't be wasting electricity anyways. at first, your title seemed quite appealing. i like shakes. but they make you put in your own milk? what the frack? i'm very curious to understand then how this is any better than buying a normal carton of slow churned ice cream and adding milk to that, aside from the oh-so-pretty design on top. if you could expound, appreciation would follow. hey, stop causing trouble! hehehehe, I can't really explain how it's any better than letting some slow churned sit in a cup of milk for several minutes... though I'm almost half tempted to try to put a half made slow churned up against these pre-made ones. ok, enough of that, I have to go be jealous that you're just moments away from an in-n-out burger. Those make your own shakes are so lame! They just taste like chunky milk! Damn you walmart! I'm eating the chocolate one as I type this. I say eating because, well, I'm out of straws. It's got a fake chocolate taste. It doesn't, to me anyway, taste like actual chocolate. I just ate the strawberry one. It was pretty good tasting. Not as creamy as I would have liked. More smoothie like than shake like. And in the end, it gave me an awful stomach ache. I won't try it again.